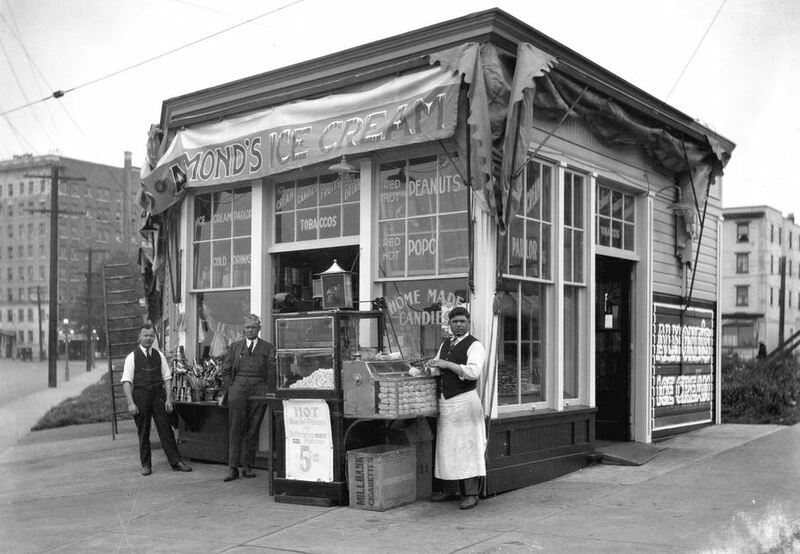 Almond’s Ice Cream Store was in a small building at the south end of the triangular block at the intersection of Denman Street and Beach Avenue. It occupied a small portion of the block, sometime after the Imperial Roller Skating Rink burned down in 1914. Almond’s Ice Cream was part of Henry Elston Almond‘s business operations, which included real estate and drug stores as well as dairy and ice cream operations. For a time, the business had its main location, including a creamery, on East Pender Street. Henderson’s Greater Vancouver Directory, 1912, Part 1, page 522. Mr. Almond lived at 1836 Comox Street from 1909 to 1917. He was a city alderman, and he died in Houston, Texas, in January 1929, while he was on a trip to promote the City of Vancouver. Almond Park, at the intersection of Dunbar Street and West 12th Avenue, was named after Mr. Almond. Thanks to Murray Maisey for updated information on the Pender Street location of Almond’s Ice Cream.